for Literature, in 2002. His work focused on the experience of the individual trapped in the barbarism manifest in the Holocaust, returning to the subject in several quasi-autobiographical novels. Kertész’s first book, “Sorstalansag” (“Fatelessness”, published 1975) had been written a decade earlier. When finally published, it received little critical attention but established him as a unique and provocative voice in the dissident subculture within contemporary Hungarian literature. The book is a detached and almost emotionless account of a 15-year-old Jewish boy, who narrates his experiences in the horrors of the Nazi concentration camps. Kertész was awarded the prestigious Kossuth Prize in 1997 and the Order of Saint Stephen of Hungary in 2014. The author said the bestowing and his acceptance of the latter was about “the desire and inevitability of reaching a consensus”. His literary awards included the Brandenburg Literature Prize (1995), The Book Prize for European Understanding (1997), the WELT-Literaturpreis in 2000, Ehrenpreis der Robert-Bosch-Stiftung (2001), the Hans-Sahl-Preis (2002) and the Nobel Prize that same year. “Fatelessness” was made into a film in 2005 (under the title “Fateless”). 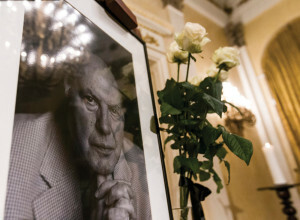 Hungary’s political parties expressed their condolences to Kertész’s family. The ruling Fidesz party said his works helped many understand the nature of dictatorships of the 20th century. Like Hungary’s 20th-century history, Kertész’s life and works were also shaped by the Nazi and communist regimes, the party said. The opposition Socialist Party said Kertész’s works help answer the basic questions of humanism and universal morality. Party leader József Tóbiás said “Fatelessness” offered a new perspective of the horrors of the Holocaust, making the tragedy easier to understand for millions of people. The green opposition LMP said Kertész raised fresh moral questions for an entire generation. Co-leader András Schiffer said the author made historic contributions to Hungarian literature. His passing would leave an unfillable space. The opposition Együtt party said Kertész’s death is a major loss to Hungarian culture. His works had made it easier for many to come to terms with the Holocaust and start anew, contributing to peaceful relations among Europeans. President János Áder said in a letter addressed to Kertész’s family that his works had spoken of the desire for freedom and happiness. Áder said everyone could be grateful for the author’s bravery and consistent honesty. The life of Kertész had been a “gift to all those who loved, recognised, read and understood him”. Kertész had seen with a clear eye the nature of dictatorships and their “irrational times” like no other. He knew that in the absence of freedom, it was only possible to bear life with a free soul, Áder wrote. In another letter to the Kertész family, Prime Minister Viktor Orbán said it was regrettable that “the great author and translator can only be with us through his immortal lines”. “History has taught us to look to the future through the lens of the past,” Orbán said in his letter. “Reading Kertész’s novels, the whole of mankind can see life in a different light”. Through his novel “Fatelessness”, Kertész had shown that “no tyranny can suppress man’s desire for life and freedom”. Publisher Magveto said Kertész died at 4am on March 31.